It’s a mandate for Civil War! In the 2015 election the tories got roughly 24.4% of the registered voters, comprising the privileged few that benefit from their policies and those wage slaves stupid and selfish enough take their masters at face value. Fair enough; there wasn’t a plausible anti-capitalist alternative and most of us* voted for nobody as usual. The Scots voted overwhelmingly (in representative terms) against austerity and Trident; it will be interesting to see how they react to having these things shoved up them when their representatives cave in. *Turnout was 66.1%, there are at least seven million eligible voters who either don’t bother to register, or are unable to due to homelessness or being on the run from domestic violence, debt collectors, or the state. Migrants and prisoners aren’t allowed to vote anyway. In other news it’s no real surprise that 7.9% of the electorate are confused, racist, misogynistic homophobes; that’s not brilliant but it’s probably gone down a bit since I was young. I’ve long suspected the function of UKIP and the funding lavished on it by its wealthy backers was purely to obscure the class issues, giving the tories room to move to the right and drag the others in their wake, and it’s worked, the BBC were in on it as well. When it all kicks off they will use these mugs as scab labour, if we let them. The bourgeoisie aren’t stupid or they would never have got away with robbing us blind for centuries; they know exactly how to work the electoral system they invented to keep themselves in power forever. Before 2010 the lib dems had positioned themselves very slightly to the left (whatever that means) of Labour so Cameron invited them into his minority cabinet with the promise of setting up their miserable carcases for life – which is all anyone goes into politics for – and ritually humiliated them for five years. As you’d expect he now has all their seats and no more hung parliament, he will now use this majority to pursue the interests of his corporate sponsors in defiance of every civilised value. The phrase ‘one nation’ and the concept of national interest have never been less valid. The population is split into two irreconcilable camps whose interests lie in diametrically opposite directions, what’s good for us is bad for the them and vice versa, one side must perish. We were never represented in government and never will be, we have nowhere to place our trust but in ourselves and each other. The good news is that there are more of us. We recognise our class interest and put it first in everything we do. We understand who our enemies are, and who they are not, don’t allow ourselves to be distracted by prejudice or self-interest. That means working with those with whom we feel nothing in common, whose lifestyles don’t appeal, or whose survival tactics make us uncomfortable. Have absolute faith in ourselves and our abilities. Look around, we the Working Class are responsible for everything that ever was and will be, when we accept that responsibility and harness our strength to our imaginations, we will do a lot better than this. Communicate and work together, reach out to and inform the politically naive and misdirected. We support each other right or wrong; it doesn’t matter what the fight appears to be about. The lesson of the Miners’ Strike is the importance of total class solidarity in the face of a concerted attack. The ruling class are hardly going to let you in on their long-term plans. Act locally; define your sphere of influence and get a grip on it. Taking everyone into the capital a couple of times a year just confirms the centralisation of power and gives the state free crowd control training at very little risk. Build support mechanisms outside of the economy, based on mutual aid and mutual respect; think about how we are going to feed each other, keep the lights on, and care for the vulnerable. Abandon the concept of transaction. Organise within the infrastructure, we’re still going to need it. The only thing that matters in a war is who’s left standing at the end of it. Autonomy Film show in Bridport Saturday 10th May 2014, 7pm for 7.30pm. W.I. Hall, North Street, Bridport 7pm for 7.30pm . 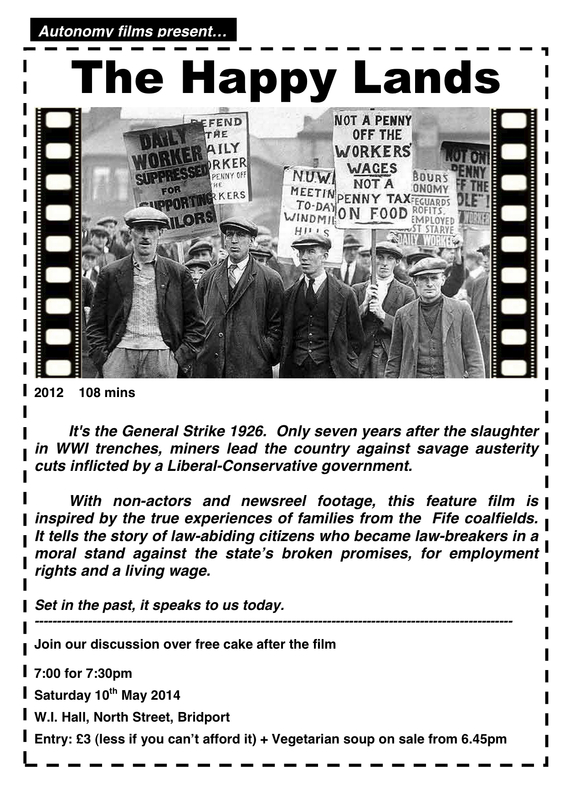 Stir presents film showing of ‘Grasp the Nettle’ Wednesday 21st May 6.45pm for 7pm W.I. Hall, North Street, Bridport. Open meeting of Bridfem (Bridport feminists) Discussion on ‘What do we mean by feminism?” Wednesday 7th May 7.30pm upstairs at Beach & Barnicott, 6, South Street, Bridport. All welcome, meetings are friendly and lively.